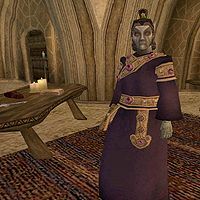 Llether Vari is a Dunmer enchanter who runs a shop in the Ald'ruhn Manor District. He has the highest base gold of any enchanter, at 2000. He is one of several merchants in the city who has a problem with Ienas Sarandas's outstanding debts. The designer shoes he purchased from him on credit have still not been paid off, and he would like your help either collecting the money or recovering the merchandise. Ienas Sarandas: Help local merchants collect on overdue purchases. This page was last modified on 27 February 2017, at 06:41.